Linebacker Jeremiah Allison has learned an important lesson at WSU: perseverance brings rewards—on and off the field. Jeremiah Allison is the real deal. He’s the kind of guy who holds doors for other people when he’s supposed to be the center of attention. Who stops an old friend for an enthusiastic hug as he passes by. Who keeps his promises. He wears a gold necklace with a pendant honoring his mother, who died in 2012, only days before his first game as a linebacker for the Washington State University Cougars football team. He had it specially made. “She didn’t like tattoos,” he says, in explaining the necklace. Lucille Allison had high expectations for her son. 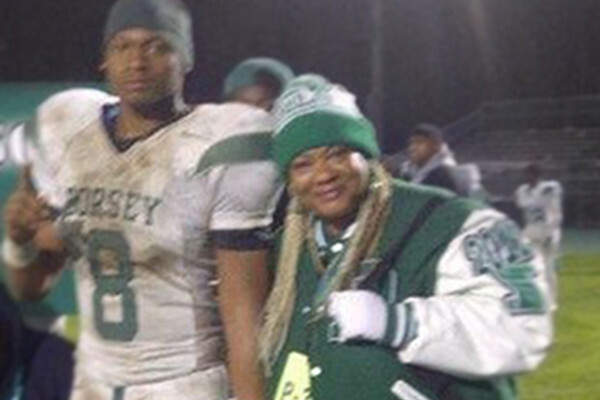 She was legendary in the Los Angeles high school football scene for her commitment to his success in life as well as in sports, for her faith that Jeremiah had the makings of a great leader. As he closes out his senior year as a Coug at the Sun Bowl against Miami, Allison is ready to fulfill another promise he made his mom: earning his college degree. In fact, he’s earning a double major in political science and criminal justice with a communication minor in just three-and-a-half years, while rising to be a core member of the Cougar defense. And he’s done it all while gaining a reputation as a genuine, dedicated student‑athlete. 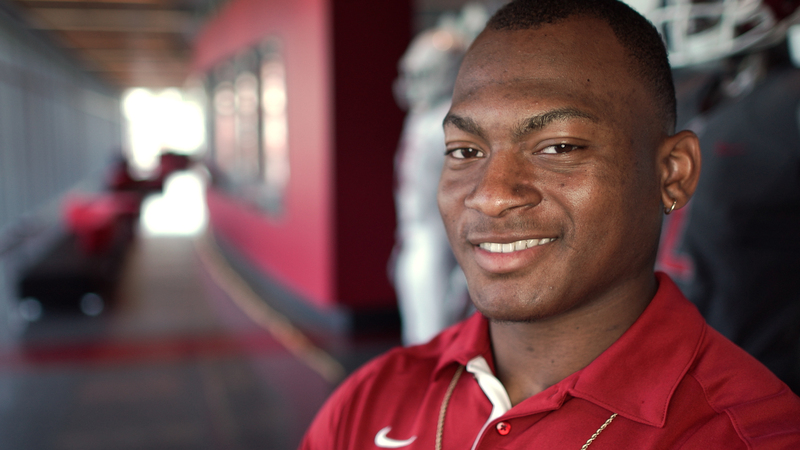 When Allison first came to Pullman, the independence of college life didn’t surprise him. He’d already learned to be an adult after his mother fell into a coma during his senior year of high school. He paid the bills, he cooked, he got himself to school, and helped his older sister and younger brother. What struck him about WSU was the quiet. At first, he couldn’t sleep because of the silence. He was unused to the rain, too, and surprised by his Washingtonian classmates’ apparent imperviousness to it. He felt like a city kid dropped into the countryside. But before long he discovered a love for the calmer pace of the Palouse and its friendly residents. Allison quickly found his place in the classroom, too. He was a top student in high school, excelling in advanced-placement courses and earning salutatorian honors with a 4.31 GPA. At WSU, classes like his freshman philosophy course taught him to value other people’s points of view and discern what characteristics he wants to make part of his own life. He thinks of himself as a realist who sees the world for what it is. Allison chose his academic path with the goal of becoming a lawyer, a dream he’s had since elementary school. He attended L.A.’s Susan Miller Dorsey High School, which has a law-themed magnet program. There, he rose to football stardom while being inspired by teachers like Donald Singleton, who opened his pre-law class by writing 100 vocabulary words on the board. Some students balked at the workload. Not Allison. Allison honed his debate skills in high school and brought his love of a good argument to WSU. He doubts he’s lost more than one debate since he was a kid, and the loss only motivated him to work harder. Beyond the chance for debate, he sees pursuit of a law career as a way to serve other people. When Allison becomes a lawyer, he hopes to return to Los Angeles and communities like the one in which he grew up. Newspaper stories from Allison’s years as a high school football star make his life seem restricted. To protect him from the gang scene, his mother didn’t allow him to ride city buses or loiter on the street. But Allison says he was part of his community, even when it wasn’t the best. His mom had rules and standards, but she didn’t hide him from the world or his neighbors. It helped that Allison was, by nature, a good kid (his favorite story about his mom involves his “rebellious” teenage act of wearing slippers to church). But he credits his mother with teaching him the value of being open to other people, whoever they are. He chose to attend a public high school, despite offers of scholarships to private schools, so he could be a good example to the younger kids in his community. He got to know the people in the neighborhoods he passed through on his way to Dorsey, and they got to know him. To prepare for the next step after commencement, he has been talking with former Cougar receiver Kristoff Williams, who’s attending law school at the University of California, Berkeley. Allison is considering Cal Berkeley as well, along with UCLA and Stanford. He wants to stay on the West Coast, preferably in California, so he’ll be prepared to take the bar exam in his home state. But it didn’t unfold like that. He didn’t play in every game. He recorded a few tackles, but nothing like his stats in high school. So he learned to be patient. If he couldn’t be a phenomenon on the field from day one, he’d focus on his education, practice hard, and make his mark through service to the community. One of the first activities he did in Pullman was tag along with Cougar offensive lineman Sam Flor to a Palouse Habitat for Humanity build day. It was his first time ever doing construction work. 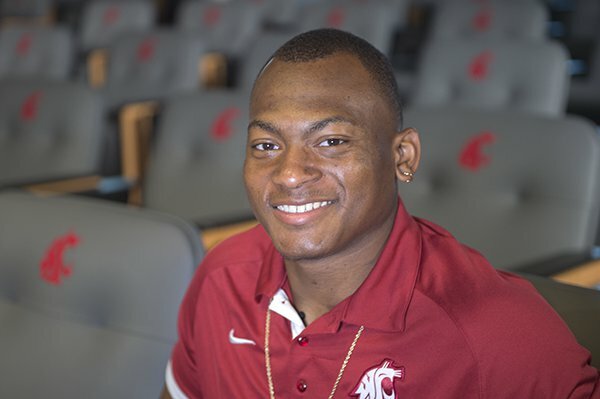 He’s inspired local elementary school kids to love books through WSU Athletics’ Reading Buddies program and helped them develop their writing skills through Coug Pals. He volunteers in his church, organizing Bible studies and providing support for other people who lose a parent. Lately he’s been visiting the Pullman Senior Center, where he’s making friends—and a few rivals. In recognition of his service work, Allison was named to the national Allstate Good Works Team his junior year, and he was nominated for this year’s team as well. In July, the All Sports Association named him to the watch list for the Wuerffel Trophy, one of college football’s top awards for community service. The award has been described as the Heisman for best human being. Allison says he doesn’t do volunteer work for the recognition, though. His mom wasn’t that type of person, and wouldn’t want him to be either. The patience Allison learned in his first season at WSU has paid off. He played in every game his sophomore and junior years. In his first game as a starting linebacker in the fall of 2014, he made 10 tackles—more than twice as many as he had in his entire freshman season. In the Cougars’ hard-fought win against Utah that September, he made a team-leading, career-high 13 tackles to keep the Utes out of the end zone. He finished the season with 78 tackles, second-most on the team. That on-field success continued his senior season, as Allison consistently ranked among the top 10 in the Pac-10 for tackles per game. He tallied a game-leading 12 tackles against Portland State and 11 in contests against Rutgers and Arizona State. In July, Allison was one of two players to accompany head coach Mike Leach to Pac-12 Football Media Days in Los Angeles. During his comments to the assembled media, Leach praised his senior linebacker for both his football and off‑field accomplishments. He’s learned, too, how difficult it can be to prove himself in a culture that doesn’t always expect the best of athletes off the field. He knows that some people look at him and other football players and make assumptions about their character or abilities. But he wants to beat the stereotypes and be known for more than his athleticism. The tenacity Allison has demonstrated at WSU and throughout his life will pay off in the courtroom someday, he expects. He’s not sure yet what kind of law he wants to specialize in—he considered criminal defense for years, but now has ethical concerns about defending a person he knows is guilty—but no matter what field of law he ends up in, he knows it will be a challenge. On a humid summer morning a few weeks before the first game of the season, Allison stands on the third-floor balcony of the WSU Football Operations Building overlooking the practice fields and the library. An hour earlier he was in his practice gear, running sprints. Now he’s relaxed, decked out in basketball shorts and socks with Nike sandals. But his mind is still on the game. He bounces on his toes and looks out over the tidy, green expanse. “I’ve got a lot of football left in me,” he says. But he’s looking to the future, too. 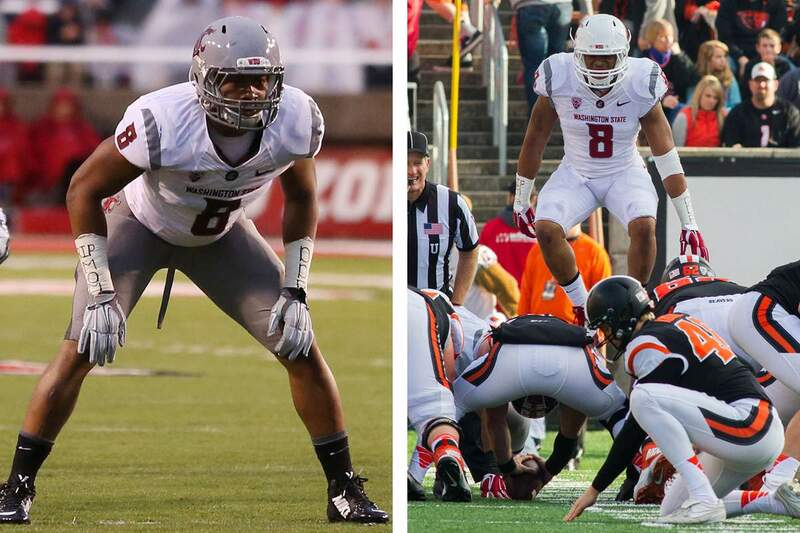 WSU has given him the chance to show what he can do, and, more importantly, who he is. But realistically, football is almost in the rear-view mirror. He’s on track to finish his academic studies and graduate in December. Up next is law school and whatever happens afterward. When he’s asked to predict the future and guess how people 20 years down the road might view his legacy at WSU, he doesn’t mention football, his grades, or his awards.